January 3, 2012, may have been the day it all came together, thanks to Shawn. Before I get into the details of that day, I want to share some things that I feel are an important part of the puzzle. I hope that by the time you finish this page, you can see it too. 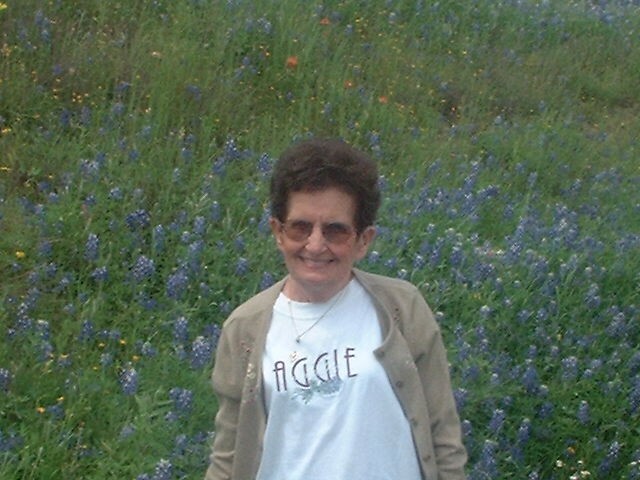 On February 28,2002, we got word that Mom was not expected to make it. Janice tried to call Shawn but he had left his phone at home so she called Zoli and asked him to get word to Shawn to get to Houston ASAP. Shawn and Zoli both came. Molly had been watching the heart monitor slowly decrease. She told us how she had seen people hang on until all loved ones were around. When they arrived shortly after 11a.m., I had just finished talking to my friend Ted Hardan as I mentioned on an earlier page. Shawn went over to hug Grandma. Molly watched as the heart monitor increased in rate and then slowly decreased to zero. Mom waited for Shawn and then she died in his arms. Thanksgiving of 2010 was the last time I saw Shawn. I met him in Austin and he took me to the A&M/Texas game with John Kane and Elise. We missed him at Christmas because he was on his way to Baltimore. It was also the last Thanksgiving with Molly's dad, Dr. Morris K. Patteson, Sr. or "Dr. Pat". He passed away 6 days later and this year his birthday fell on Thanksgiving. Heavy hearts and blessed memories we had through Christmas. Janice and Gwen are simply amazing! Below you will find 2 photos taken at Shawn's gravesite. 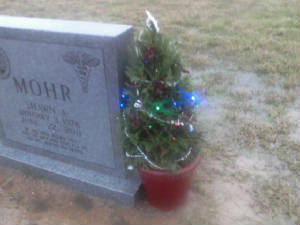 They had put a Christmas tree at Christmas and then a birthday cake on the 3rd. I knew this day was going to be tough having gone through the holidays and then on New Year's Eve I received an email from Facebook that I had a friend with a birthday this week. I opened it and read Shawn's name and it felt like a ton of bricks just landed on my heart. I lost it. On Tuesday I went to work at 5 and got home about 12:30, trying my best to make it just another day. Molly was going back to work and I told her I was going to try and catch up on some bowl games that I had recorded. Instead I got on the computer to play a few games of hearts and listen to some music. At 1:05, I get a nice text from Zoli that he was thinking of us. I lost it again. As I sat there trying to play a game, I decided I wanted to go to Shawn. I tried to call Molly but could not reach her until about 2:30. She wanted to go and she would drive. Good thing. I was so emotional I couldn't even call Janice to tell her we were on our way. In our vehicles, I have put aftermarket satelite radios because I love the classic rock stations. My radio has a "favorite" setting that will notify me by a beep when, Lep Zeppelin, Jimi Hendrix, or Stevie Ray Vaughan is playing. It tells me the artist, song, and station and all I have to do is hit "select". 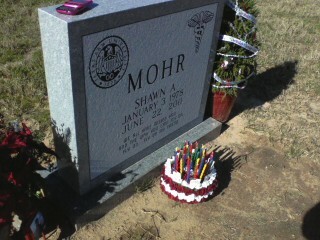 As we drove to the restroom, I looked over towards Shawn's grave and saw Joseph walking up to it. I thought, "Great! We will get to see Joseph!" By the time we came out, he was gone and Melissa was there. We got a great big hug. As I sat by Shawn's grave trying to talk to him I commented on how we had such a spiritual connection with Mom and the signs and I wanted to know why he had not sent me a good sign. Little did I realize that he had sent me the best sign ever through music as we were entering the cemetery. He got one up on me.......again. After gathering myself, I walked back to the car. Molly had got in touch with Janice and they were on their way. While we were there, a fighter jet flew over very low and it was loud. I would guess that he was no more than 1000 feet above us. As I looked up, it had NAVY written in huge letters on the back side of the fuselage. Dr. Pat was in the Navy! It would be just like him to buzz us. But think about it, what is a Navy jet doing flying over College Station?? When Janice and Gwen showed up, she showed me the Christmas lights and we lit the candles as mentioned above. The sun was setting with a beautiful sunset and they had brought some Christmas gifts since it was the first we had seen them since September. So we sat there in our van and opened a few gifts and had our Christmas with Shawn on his birthday. I think Mom, Mamaw, and Dr. Pat were there too. Click the "play" button below to hear this song and read the lyrics below. There are 2 versions to this song. You can find them easily online. This version is actually the 2nd but is the one he promoted. Then she spread her wings high over me. 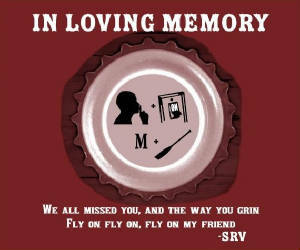 And I said fly on, my sweet angel. This woman came unto me. Today is the day for you to rise. After I heard the song and read the lyrics, my first thought was "Mom was THERE!". That was the first thought I had after I took the photo at Mom's funeral. She was there for Shawn! Has this come full circle? Needless to say, I lost it again while I was listening to this song and reading the lyrics. WOW!! Thank you, God. Thank you, Shawn. Thank you Mom. I can remember talking to my cousin Sandra in her driveway in Cameron about this soon after Mom passed. This song took on a new meaning after that, especially the last verse. I could not explain it, I did not know what it meant. After almost 10 years, maybe this is me finding all the pieces to my puzzle. Below you will find the last verse in maroon and my puzzle pieces in blue. 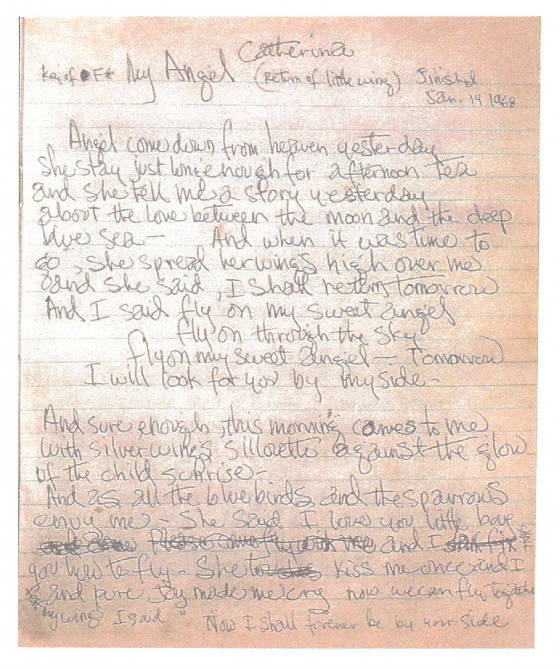 Below you will find a photo of the lyrics written by Jimi Hendrix. I found this online. Either version would suffice, but this one has a reference to a "little boy" that is not in the other one. Just click the "Play" button below to listen while you read the lyrics. Will this be the final page added to Angel Bluebonnet? I really don't know, but the reason I mention this is because I have a very strong feeling of "completion". Not closure......completion. Before 2002, I had not experienced anything like this, ever. And Shawn has been such a huge part of it; the white pigeon, the butterfly, On A Cloud, so much more, and now Angel. I remember talking to him about this the last time I was with him. We went early to the Texas game on Thankgiving so we could check out the tailgating. A strong cold front blew in and so we just sat in the van and talked for about 3 hours. I remember telling him how sometimes it drove me crazy trying to figure it all out and he said,"I know, but I have come to accept that it is what it is and I am thankful for it." Simple logic was one of his better traits and I am so thankful for those 3 hours. First I want to tell you how thankful I am for the sign on the radio and the message via Jimi and his music. You knew how much I needed that. 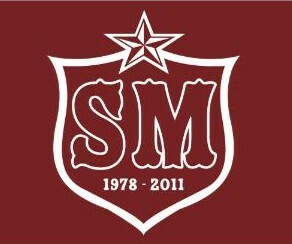 Thanks for allowing me to be a part of your life for 33 1/2 years. I love you so much and miss you terribly. The selfish part of me wants so much more, but as you would say, "It is what it is and I'm thankful for it". I know now what I need to do. Your incredible smile and passion for nursing will live long after I am gone. I will see to that. It's time to get started because the clock is ticking. Give Mom a hug for me. Fly on, my son. It is 11 days after Shawn's birthday. P.S. After reviewing the page to see if it was ready for publishing, I just noticed something that I had missed. If you will scroll back up to Jimi Hendrix's handwritten lyrics and look in the top right corner. He had written: "Finished, Jan. 14, 1968" WOW again. That was 44 years ago today, and if you go back to the "Shawn Allen Mohr" page, you will see that it was 44 years from my Daddy's funeral that we heard from the medical examiner about Shawn. It is what it is.